Purging is a process where yabbies are stored and starved to allow the contents of their digestive system to be evacuated. The aim is to have the stomach and hindgut or wasteline through the tail empty before transport and sale. Purged and graded yabbies are generally considered superior to wild catch yabbies and attract a premium price in the market place. Purging is preferred by yabby farmers for two main reasons, firstly for restaurants as it’s easier and better for the chefs to have a purged product without an unsightly hindgut line; and secondly for transport; purged yabbies transport and survive better than unpurged yabbies (they just travel better on an empty stomach). In NSW, food safety is overseen by the NSW Food Authority. We are very luck in NSW to have this highly professional department helping the industry to ensure all consumers of seafood are protected in NSW. Unlike some other states that have an unbelievably unprofessional food safety department (some states have food regulations based on “I’ve got a feeling”) in NSW everything is based on science looking at all the risks and methods to control or reduce risks (HACCP). Hazard analysis and critical control points or HACCP is a systematic preventive approach to food safety from biological, chemical, and physical hazards in production processes that can cause the finished product to be unsafe, and designs measurements to reduce these risks to a safe level. In NSW the NSW Food Authority has found that there is little risk in growing and selling live yabbies. There are no reported food safety incidents resulting from consuming purged, or unpurged yabbies in Australia so in the great state of NSW there is NO requirement for a “Food Safety Program or Food Safety Licence” and no government regulation that you must purge yabbies. Purging is entirely voluntary in NSW. As per The Commercial Yabby Farmer book, there are 3 methods to purge yabbies. Cages in dams, tanks in a shed, or spray rooms. All these work to some extent but each comes with both benefits and problems. Purging/holding in a dam works but you have little control over predators, water quality and security. This is not a method typically used by professional commercial farmers and more suitable for farm dam harvesting. (See the Commercial Yabby Farmer for the different types and methods). Dam purging is usually suitable if only holding a day or two. Spray or drip rooms are a more common system used by professional commercial farmers. Personally, I don’t like them, from my experience they work well for purging, possibly even better than tanks or dams and have a much smaller footprint. However, the major downside is the yabbies are stressed by the process amongst other problems. (See the Commercial Yabby Farmer for greater detail on methods and problems). Maximum holding of 3-5 days only in spray/drip rooms. Best for eating yabbies only. 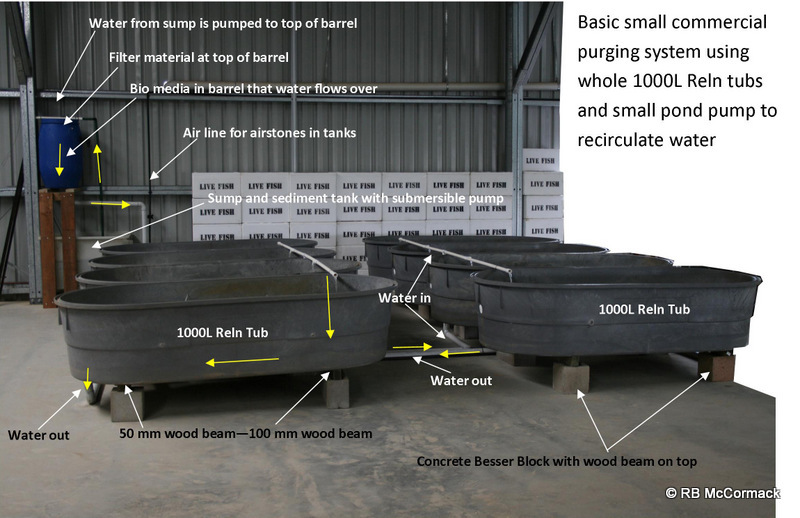 This article is on tank (solid water) purging systems. From my point of view these are the best for both holding and purging of yabbies that are going to be sold alive and need to stay alive long after transport to the customer. Many yabby farmers sell yabbies for purposes other than for human consumption, this could be bait, dam stock or aquarium yabbies, etc. ; all these need to remain alive long after the customer receives them. A commercial yabby farmer typically has orders each week every week and typically would be holding this week’s orders and next weeks as well. Good purging/holding systems must be capable of holding the yabbies indefinitely. A good purging/holding system should have minimal mortalities within the system. An acceptable mortality rate is less than 1% per week (1 yabby per 100). Ideally it should be 0.003% per week (3 yabbies/1000). Make no mistake, if you have gone to the effort and expense of growing a yabby and then harvesting that yabby, then you can’t afford to lose it in your holding system. 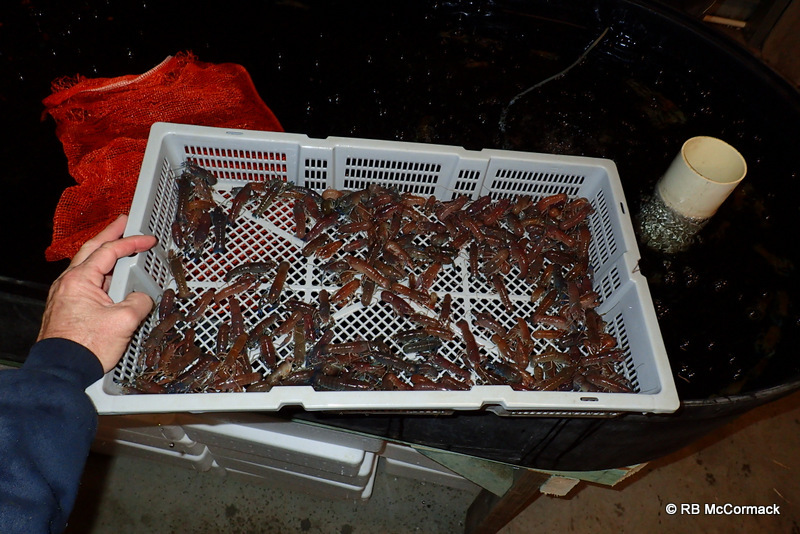 Harvesting and handling the yabbies prior to release in the purging system is critical, but let’s assume that you have harvested and handled your yabbies correctly before you bring them directly into the system. (consult The Commercial Yabby Farmer for harvesting/handling details). For this exercise we are going to use standard off the shelf water tanks. Reln 1000 litre oval water tub. 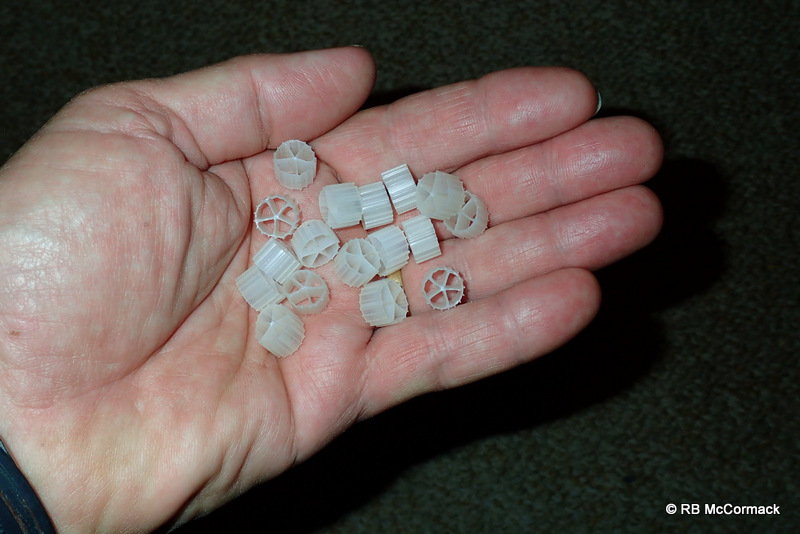 They are non-toxic, food-compatible, UV-stabilised polypropylene. Or you can use them cut down to 500 litre tanks. Typically, most commercial farm use cut down tanks. 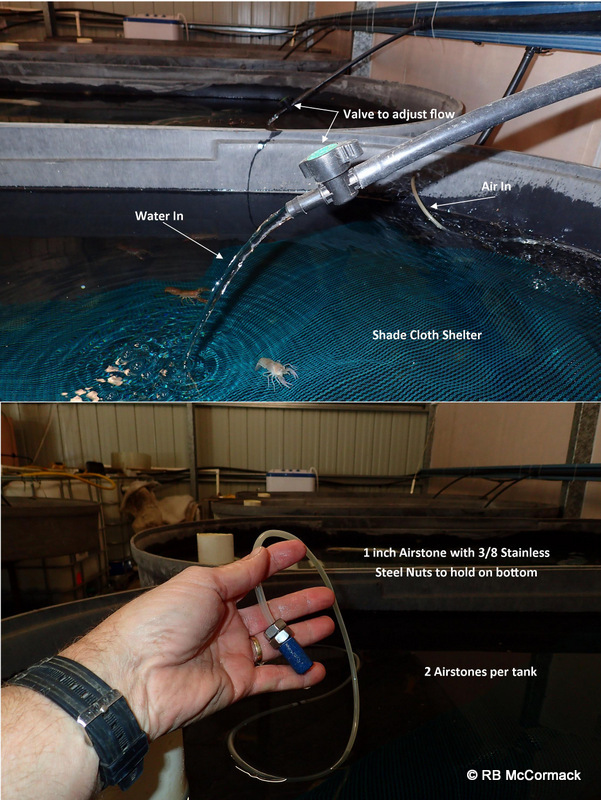 To purge and hold yabbies in tanks with minimal losses is relatively easy if you understand a few basic common-sense requirements for your yabbies. Make no mistake, you are not building a system for your comfort as the priority but for the yabbies comfort as the priority. Everything you do must be designed to reduce yabby aggression and stress. The following are a few basic prescripts. Stress is a killer. Stress is accumulative – a yabby may tolerate one stress, add another different stress and it deteriorates quickly, add another form of stress and it dies. Everything you do is designed to reduce stress in your yabbies. Tank shape is of little importance to the yabby. They can be rectangular, square, round or any shape in-between. The consideration is that they need to be non-toxic and escape proof, so need sides that are smooth enough that the yabbies can’t find purchase and climb up and out. Yabbies only use floor space so typically you need a relatively flat floor in your tank. Conical bottom fish tanks are not suitable. Tanks size is more important, 1 metre square is your minimum size and that’s only suitable for bait yabbies. Ideally 2 square metres is the minimum floor space you need. Yabbies need room to move and not feel too constricted, if they can move distances to escape aggressive individuals they will be less stressed, if it takes them a while to wander completely around the tank they will be less stressed. When confined in close proximity to others they are stressed, when in the same densities without constriction they are unstressed. Unlike fish, yabbies only use the floor space not the water column so you don’t need deep tanks. Depth is a critical factor as your tanks can’t be too shallow. The minimum water depth is 100 mm and preferably 200 mm if you can get it. You can use deep tanks if you have them but most of that water will be wasted. 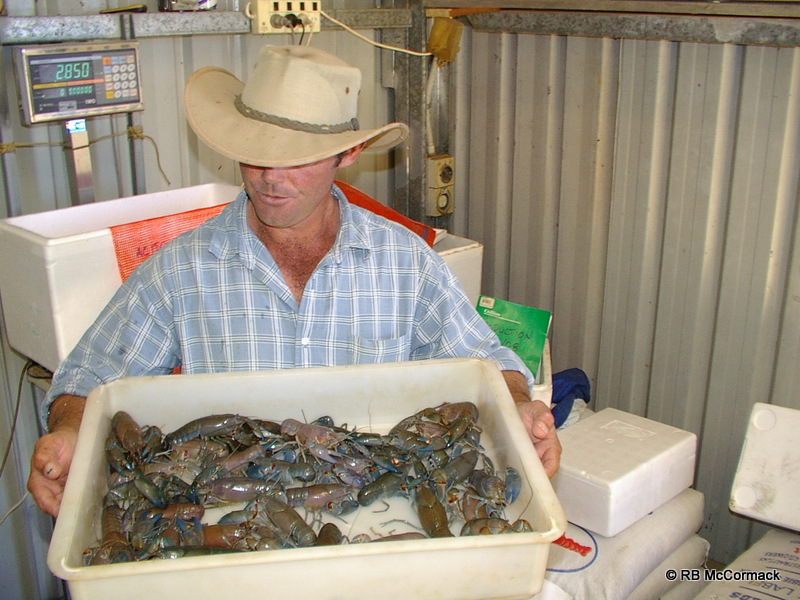 –Prawn Crates-Many farmers use prawn crates to store yabbies in. These are the same crates you would use in a spray/drip room. Typically you have 1kg per crate. 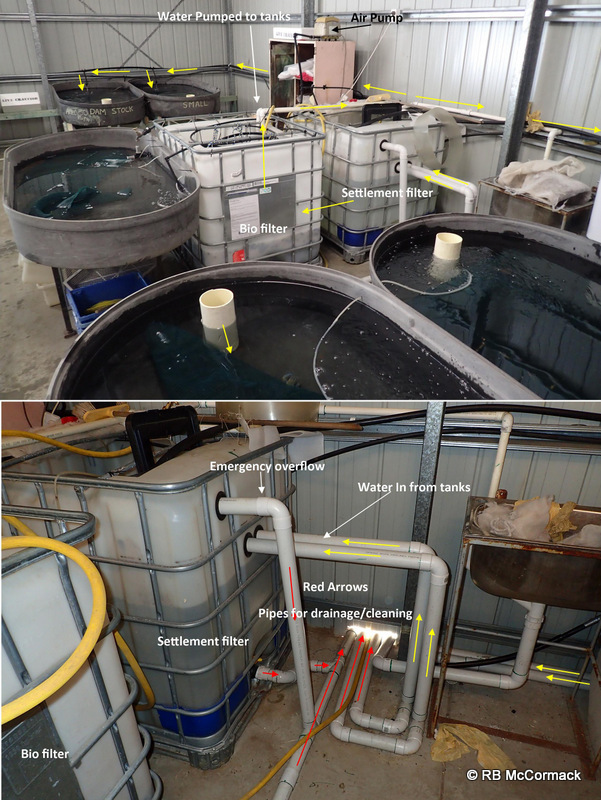 If you have deep tanks you can stack crates one on top of the other and use the whole water column; this dramatically reduces your footprint, but…….. I don’t like this method, it’s only good for very short term storage as you are now confining the yabbies close together without any room to move away from aggressive yabbies. You will quickly find that all the yabbies in a prawn crate become very aggressive and stressed, they all have open claws and many will be locked onto other yabbies. In this type situation they deteriorate and weaken quickly. Additionally, they tend to stick the tips of their legs out the bottom of the prawn crate and these tips tend to get broken off. These are their feeding legs/claws so not good if you want them to feed in the future. Additionally, you need to daily check your purging/holding system for dead ones as they decompose and grow bacteria/fungus very rapidly and that will impact your water quality. 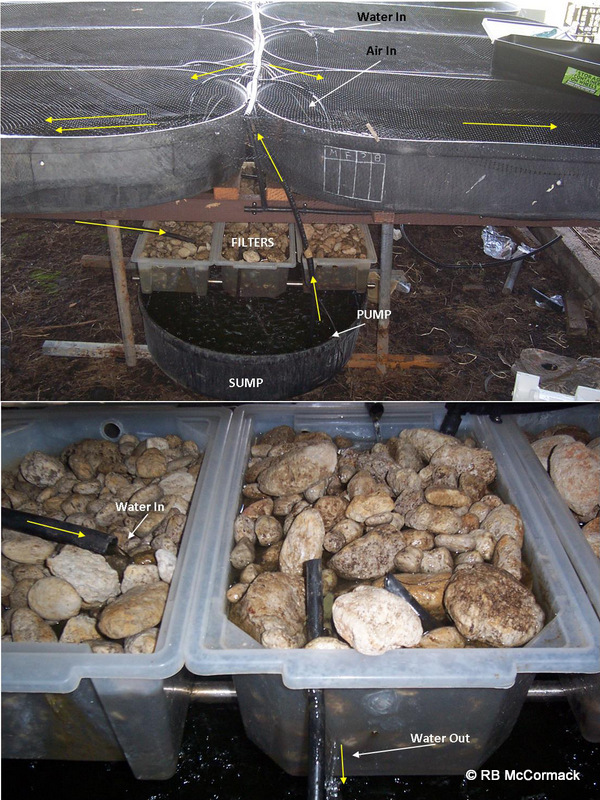 A tank with 10kgs of yabbies free crawling in it can be checked in 10 seconds for dead yabbies. The same tank with 10 prawn crates will take 20 seconds/crate if all goes well. If you have 10 tanks then its 2-3 minutes per day without crates or 40-50 minutes/day with crates. Prawn crate method is not recommended as it injures and stresses yabbies and stress is a killer. This is a critical factor, you need dark colours to keep your yabbies unstressed. Many people like light coloured tanks as it is easier to see your yabbies but this is a critical mistake, you may be able to see the yabbies better but they will be very stressed in those conditions. Gentle lighting is best and dark conditions good. Caution in turning lights on and off as that change will stress your yabbies. If you are going in and out all day, leave the lights on all day, don’t turn them on and off all day. 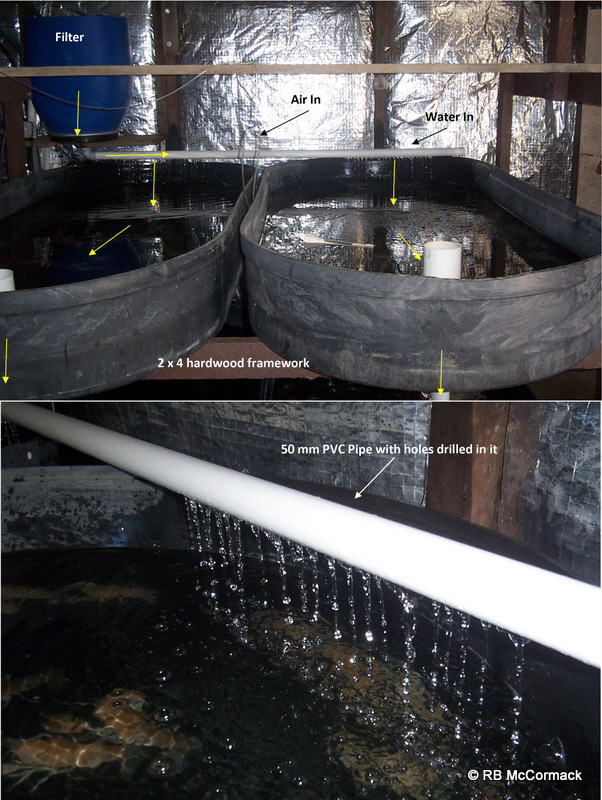 If you are running a recirculating aquaculture system (RAS) then sunlight is the enemy and needs to be eliminated. Ideally, the system needs to be fully enclosed in a shed without any skylights, etc. Water temperature is a critical factor. Yabbies are cold blooded animals so the cooler the water the quieter they are going to be. Your water needs to be between 10 and 15˚C. Below 10˚C and your yabbies are not feeding so it will take a week or more for wastes to move through their system and out. Over 10C then the purging process moves faster. This is the catch 22; for example at 11˚C your yabbies will hold exceptionally well, they will be quiet, non-aggressive, not very hungry and will hold for weeks without losing condition. Holding your water at only 11-12˚C is the ideal temperature but purging will take 4-5 days. At 15˚C they are far more active, aggression increases and they will feed well. 72 hours = 90-100%. Generally 100% empty hindgut for all your yabbies is not achievable as some just don’t purge well despite the time given to do so. The temperature of your purging/holding system should be designed for the amount of time you need to hold your yabbies prior to transport/sale. Regardless of the size of your tank the flow rate is the same. One exchange/hour. You need to replace the full volume of the tank every hour. 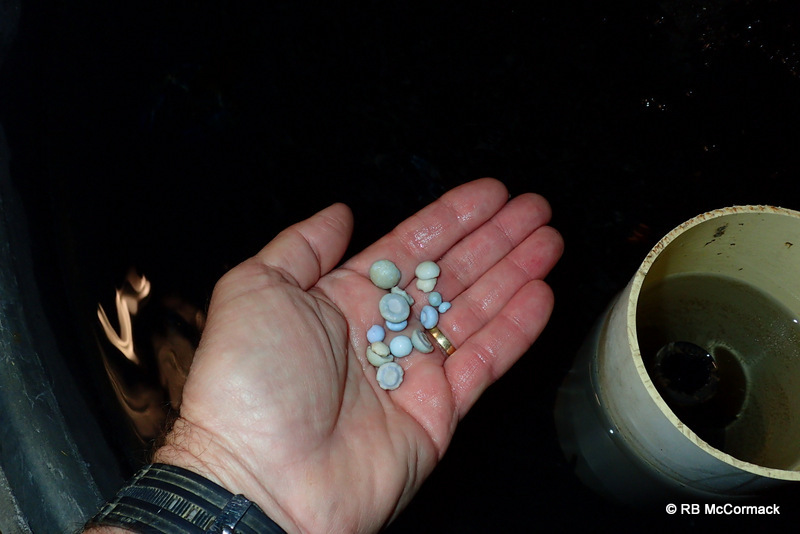 Yabbies will recycle wastes so you need a flow rate that is strong enough to remove the wastes from the tank. Just calculate the volume of your tanks and pick a pump that’s capable of pumping that much water per hour. Check your individual flow rate by using a bucket and stopwatch to see how many litres/minute etc. Remember; your pump runs 24 hours/day so power usage/cost is a major consideration, don’t use high voltage pumps or bigger than you need pumps. Hides in your purging/holding tanks help reduce stress. Hides need to be easily movable, cleanable and a shape that doesn’t trap wastes. Preferably dark in colour as that is also stress reducing for your yabbies. Typically, we just use pieces of shade cloth (knitted shade cloth, NOT woven). All tanks should have an independent air supply. Yabbies have gills like fish and breathe oxygen from the water. You need to ensure there is ample oxygen available in the water. Your water exchange is bringing in reinvigorated water to the tanks at a rate of a complete tank full/hour which is technically all you need, however, if for any reason your pump stops then you need a backup and that is the independent air supply. You need at least a 1 inch airstone/m2 of floor space. We use lineal compressors, around 120 watt power usage and these run 40-50 airstones. An ideal stocking rate for long term storage of yabbies is 2.5kgs/m2. At this density there will be little aggression and little mortality. You can boost this up to 4-5kgs/m2 for short term (couple of days) but aggression will greatly increase and expect mortalities. (Typically, a prawn crate holds 1 kg/crate. Crates are generally 610 x 360 mm = 4.5kgs/m2). Your yabbies will only survive in a RAS system if your water quality is good. They will only purge if you can remove their wastes from the tanks relatively quickly so they dont recycle them. 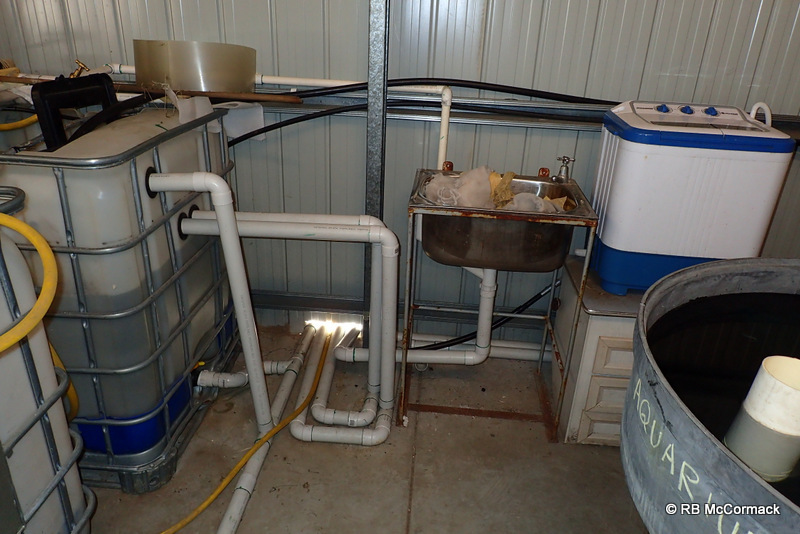 Typically, with purging systems you dont need anything special as you just need to get rid of wastes and you are not feeding or growing the yabbies in the tanks. Filters usually consist of 2 parts, solids filtration and bio filtration to counter ammonia build up. 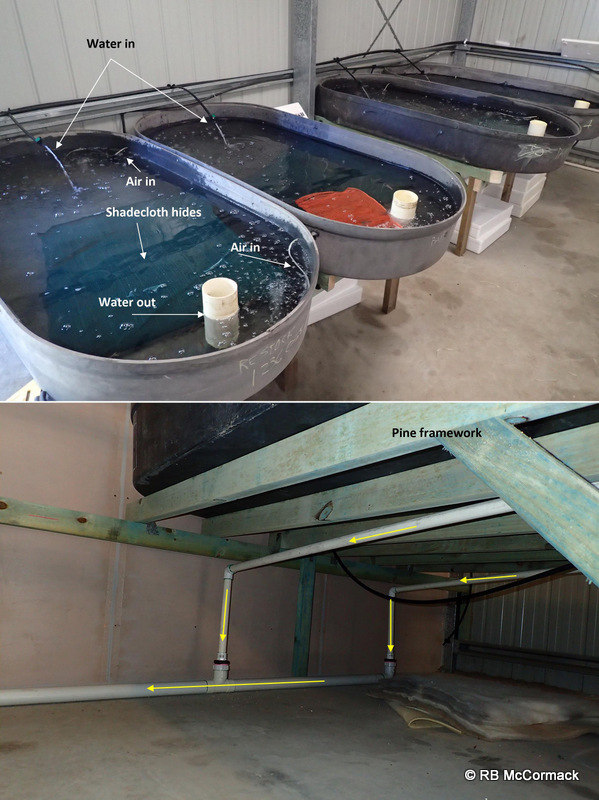 System 3 just uses pumice as both the filter and biofilter. Each of those 6 small pumice tubs are pulled from the system, emptied out, hosed off and then put back in the tub and back into the system. A very, very, basic system but it does work. In system 4, water flows from tanks under gravity flow and carrying wastes and ammonia. Water enters the first IBC tank and solids tend to settle out. The bottom of this IBC is syphon cleaned for 3 minutes every few days so there is little or no buildup of sediments. Water from this tank overflows into the next IBC which has a final filter and bio filter. 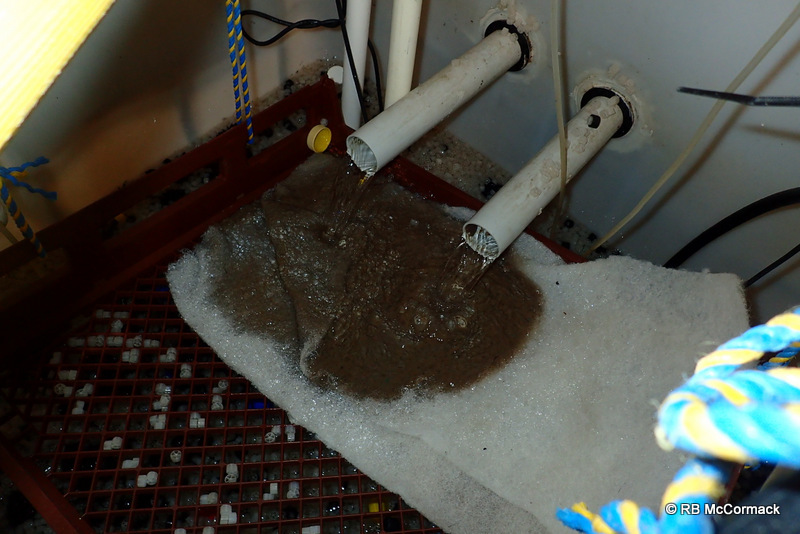 Dacon is a fine material that collects all suspended solids and strains out pure clean water. The Dacron is exchanged every 3 days or so. This one is 3 days old with 47kgs of yabbies in the system. Dacron is washed in a small caravan style washing machine. Two only 2 minute washes and then spun dry. Water drains through the dacron and into the IBC that is full of K1 bio media. This is the media that bacteria lives on to eat ammonia. K1 Bio Media are small plastic media which provides the maximum active surface area for the bacteria to colonise. It is this process which removes harmful ammonia and nitrite from the water. The K1 is highly aerated to keep it moving and agitated causing the old dead bacteria on the outside to be displaced. This makes space for new younger heavier feeding bacteria to rapidly recolonize the media. From the Bio Tank water is pumped back to the purging tanks. The purging system can be as simple or as complicated as you like, but if you follow these basic prescripts you cant go too far wrong. Ideally, you yabbies should be calm and move away if your hand approaches them. They should not have their claws open and if you move slowly they will not nip you. If your yabbies are too slow and lethargic and don’t move away they are stressed and will eventually die. If they have their claws open and fighting off other yabbies and you then they are stressed. If they are dropping claws in the tank they are stressed. If they start taking on a light pink colouration to their bodies then they are stressed and will eventually die. If yabbies are on top of the hides and trying to get out of the water your oxygen levels are far too low. If there is foam/froth in your tanks your water quality is deteriorating and ammonia levels are too high. If your water is not clear then you have a problem. If you can smell the water, you have a problem. If you see gastroliths in your tank then a yabby has moulted and been consumed by other yabbies. You don’t want any yabbies to moult in the tanks. You need to be observant and get to know the normal behaviour of your yabbies and be able to recognise abnormal behaviour as that will indicate a problem looming. This entry was published on November 4, 2016 / Rob McCormack. Posted in Consultancy, Uncategorized and tagged Recirculating aquaculture, yabby, Yabby farming. Bookmark the permalink.